Malocclusion is the technical word for when the upper teeth don’t line up with the lower teeth – in short, a misalignment of the bite. With mild to moderate malocclusion, the Steele Creek Dentist can usually correct it with braces. An overbite transpires when the upper front teeth come down too far over the lower teeth when the mouth is closed. An underbite is the reverse – the upper front teeth close farther back than the lower front teeth. An open bite refers to a bite in which the upper don’t overlap the lower teeth. This can occur on the whole bite or just one side. When the upper and lower palate are offset to the point where the upper teeth close onto the wrong side of the lower teeth, it is labeled a cross bite. In some rare cases – called transposition – teeth erupt in spots where other teeth should be. For example, a canine (pointed tooth) comes in where an incisor (front biting tooth) should be. Crooked teeth can increase the risk of cavities, tooth damage, and temporomandibular joint (TMJ) disorder. Children with crooked teeth may have difficulty learning to speak, and if they can’t chew correctly, they may miss out on needed nutrients due to a limited diet. In addition to general and cosmetic dentistry, the Steele Creek Dentist provides patients with metal braces, and Invisalign clear braces. 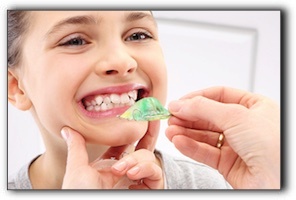 If you or your child has crooked teeth or a misaligned bite, we invite you to schedule an examination.